At long last, it's finally time for the second hardcover collection of SAGA, the New York Times best-selling series praised by everyone from Alan Moore to Lin-Manuel Miranda! 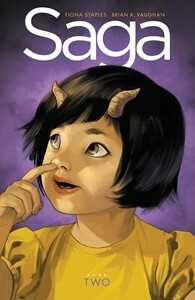 Created by the multiple Eisner Award-winning team of artist FIONA STAPLES (Mystery Society, North 40, Archie Comics) and writer BRIAN K. VAUGHAN (THE PRIVATE EYE, PAPER GIRLS, WE STAND ON GUARD), SAGA BOOK TWO continues the action-packed education of Hazel, a child born to star-crossed parents from opposite sides of a never-ending galactic war. Collecting 18 issues of the smash-hit comic, this massive edition features a striking original cover from Fiona Staples, as well as a brand-new gallery of exclusive, never-before-seen SAGA artwork from legendary creators including CLIFF CHIANG, PIA GUERRA, FAITH ERIN HICKS, KARL KERSCHL, JASON LATOUR, SEAN GORDON MURPHY, STEVE SKROCE, and MORE! Deluxe Hardcover format - 7.25 x 10.875". Collects SAGA #19-36.